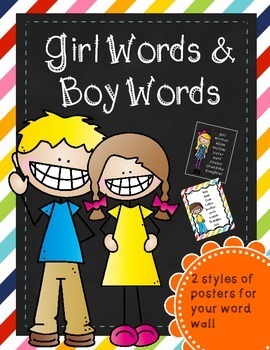 I created these "girl" and "boy" word posters, which I post on the girl's and boy's bathroom doors in my room. 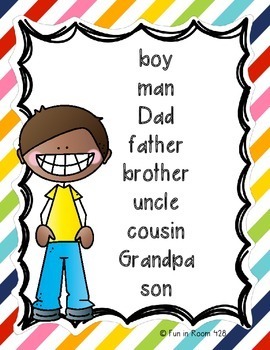 The "boy" poster contains words such as man, grandpa, brother, uncle, and dad. 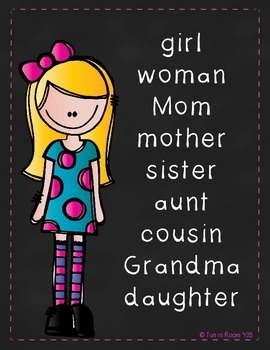 Girl words include woman, grandma, sister, aunt, and mom. 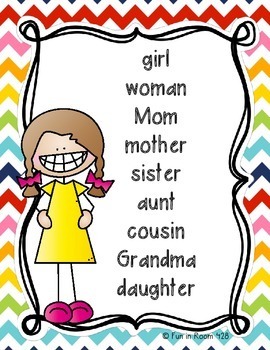 I added the word cousin because it's a word that my kids usually ask me to spell for them. There are two types for you to choose from based on your classroom decor. I enlarged my printouts into posters, which can be done at an office supply store if your school doesn't have a poster printer.